You are here: Home / All Posts / Stage To Page: Amazing Show ‘Dirt’ To Become A Graphic Novel! What began as a therapeutic side project has turned into one of the most popular assemblies for students across the country. Actor/Comedian John Morello considers himself a survivor of a high risk childhood. Having spent most of his life watching friends and family become victims of destructive decisions he responded by writing the one man show “Dirt”. 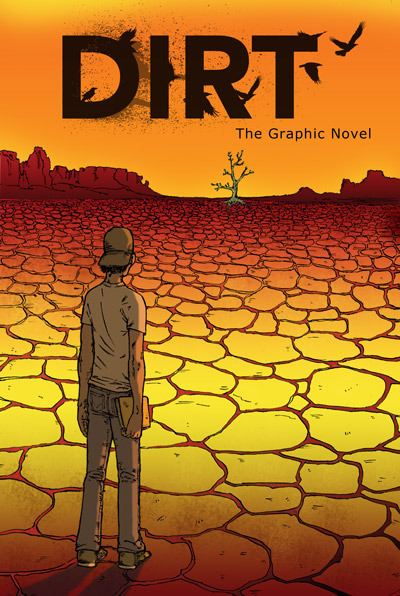 The character Hank from the show ‘Dirt’ by John Morello. 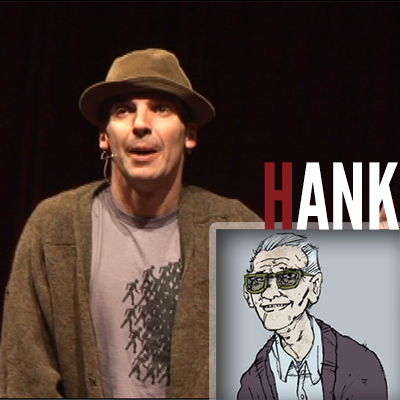 Hank: An 80 year old WWII veteran who reflects on his life, his choices, and his care for the young people in his life. He has seen his country at its most heroic and its most ignorant having lived before and after the civil rights movement. He is a husband, a father, a grandfather, and a victim of a cruel joke at the hands of the young people in town. He is living proof that a hero is not always born on the battlefield of war but in the everyday battles that our loved ones face. Hank eventually ties up all the loose threads of the story. Not a lecture or seminar, “Dirt” is a play of many characters all performed by one actor. With 15 years of stage experience Morello comically and effortlessly slips in and out of the characters to tell a story which is compelling, unique, and yet is unfortunately the story of far too many of our young people. Audiences are sure to see someone they know or can relate to and it is this cathartic recognition that has been connecting with young people across the country. 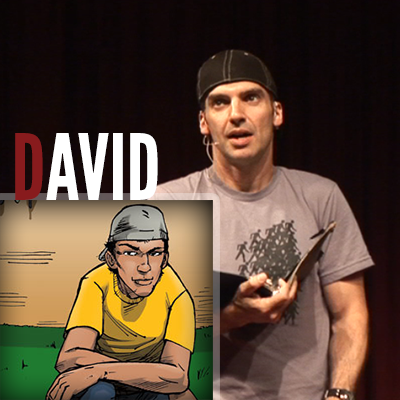 The character David from the show ‘Dirt’ by John Morello. The protagonist. A high school student tangled up in ecstasy and prescription drugs. Pi is outside school society and angry at life in suburbia. Despite his quick wit and often harsh assessment of his peers he is able to have compassion for others who are bullied and maybe even help them but unable to help himself. He is finding his drug use to be more frequent and more problematic. Recently Morello’s show “Dirt” has become the number one recommended assembly for young people by the New England and New Jersey chapters of SADD, MADD, and ASAP (Association of Student Assistance Professionals). “Dirt” is now endorsed for camps and retreats like TIGS, MADD Power Camp, and numerous peer mediation groups. 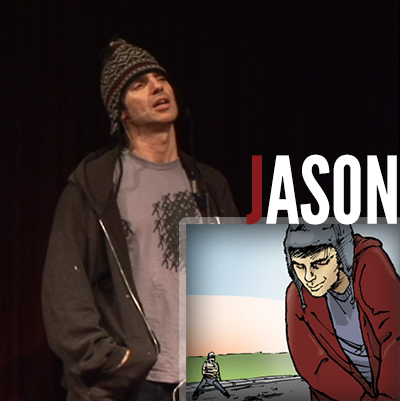 The character Jason from the show ‘Dirt’ by John Morello. Every town’s “stoner” who sees weed and his actions as harmless. He is musically talented but disconnected and drifting further away from a future filled with real potential. He spends most of his time hanging out with and helping his cousin who is a special education student which makes him likable and perhaps noble. He does this not only because he cares but it also lets him, in a way, hide from people who would expect any kind of success or life plan from him. The formula for this success is quite simple according to Morello. “ Kids don’t need flashing lights, cliches, and a circus production to connect with them. Like all of us they want honesty, respect, and someone who is real.” As characters speak honestly about their experiences the audience understands how seemingly disconnected lives are indeed tied together and influencing each-other. In the end “Dirt” addresses the core reasons for substance abuse such as self esteem, depression, and a desire to find a purpose in this often chaotic life. The character Melissa from the show ‘Dirt’ by John Morello. A quiet goth-punk student with a dark sense of humor and an even darker past filled with sexual assault and bullying. She is sarcastic in her view of life and often fantasizes about the damage she could do to herself and others if she were pushed too far and unable to control herself. She tolerates living with her Mom and stepdad and fights an inner battle of monsters and ghosts while trying not to become one herself. It’s a great project, doing great work. Artist John Morello, Give Us Art! salutes you! Want to see more about the project? Want to help? Well, all you need to do is go here! Art the World, to save the World! « Thank You, Agnes Martin, for Making Me Hate Your Painting!